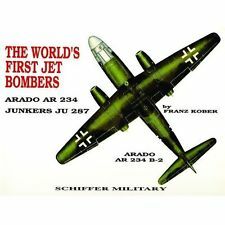 YellowAirplane.com: World War 2 German Fighter Jets, Die Cast Model Airplanes and Plastic Model Kits. World War 2 German Fighter Jets, Die Cast Model Airplanes and Plastic Model Kits. of the Fighter Jets Model Department. Model Kits, World War 2 German Fighter Jets, The first fighter jets to enter the war. Plastic Model Airplanes, diecast models, mahogany models. A great selection of World War 2 German fighter jets and Rocket Powered fighter jets, diecast model airplanes and plastic model kits. The Germans were the first to use fighter jets in the war and the first to put successful fighter jets in production in World War 2. These model airplanes are scale model airplanes with very accurate detail. These World War 2 model airplanes come in plastic model kits, balsa wood models, mahogany models, display models and die cast models. Me -163 model airplane. Wagner. 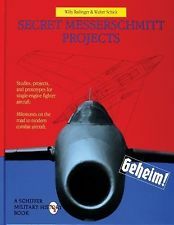 A detailed analysis of jet aircraft design and development in Germany from the first drawing board projects to late war jet engine production. Carried on under utmost secrecy, and despite a lack of raw materials and Allied bombing, marvelous new age aircraft took to the skies, too late to make a difference in the outcome of the war. 260 pgs., 260 photos, 8"x 11", hdbd. 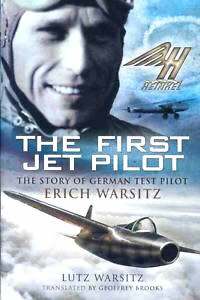 The Story of German Test Pilot Erich Warsitz. Warsitz. 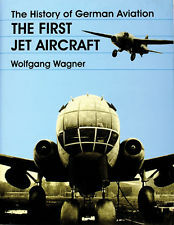 This book examines the fascinating life of pioneering German test pilot Erich Warsitz, who, in 1939, became the first man to fly both a jet-powered aircraft (the Heinkel He 178) and a liquid fuel rocket-powered aircraft (the He 176). You'll read about the birth of the jet age, Warsitz's work with legendary designers such as Wernher von Braun and Ernst Heinkel, and much more. 176 pages, B&W photographs, 6"x 9", hardcover. On 27 August 1939, Flugkapitan Erich Warsitz became the first man to fly a jet aircraft, the Heinkel He 178 and in June of the same year he flew the first liquid-fuel rocket aircraft, the Heinkel He 176. His legendary flying skills enabled him to assist the pioneering German aircraft and engine design teams that included Wernher von Braun and Ernst Heinkel. He repeatedly risked his life extending the frontiers of aviation in speed, altitude and techlogy and survived many life-threatening incidents.This book is written by Erich's son who has used his father's copious tes and log books that explain vividly the then halcyon days of German aviation history. Warsitz was feted by the Reich's senior military figures such as Milch, Udet and Lucht and even Hitler keenly followed his experimental flying. Little is kwn of this pioneer period because of the strict secrecy which shrouded the whole project - it is a fascinating story that tells of the birth of the jet age and flight as we kw it today. The book includes many unseen photographs and diagrams. Pavelec. In the 1930s, the German military buildup caught Britain and America off-guard, particularly in aviation technology. This analysis captures the excitement of the high-stakes race to develop effective jet engines for warfare and their development through the end of World War II, from the first turbojet engine designed by Hans von Ohain in 1939 through the Gloster Pioneer and Meteor, the Bell Airacomet, and beyond. 248 pages, 6"x 9", softcover. Between 1935 and 1945, the Germans, British, and Americans all raced to see who could develop jet engines first and best, in order to gain the technological edge in the air war and beyond. 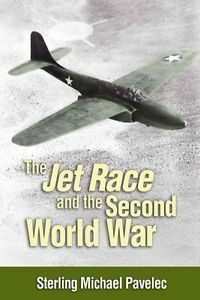 The story of the World War 2 'jet race', in which the Germans, British and Americans competed to gain the technological edge in the air war and beyond. This book outlines the competing jet programs during World War II that took place in Britain, Germany, and the US. The British program was hampered by inconsistent government interest, and little real need, the US program to develop a jet also lagged because of strategic concern. In Germany, the need for the technology existed, the innovative spirit of several designers, and official funding combined to produce a combat-operational jet aircraft despite wartime limitations. Analyzing a variety of primary and secondary materials, this book provides a comprehensive comparison of the three (ultimately) successful jet programs of the war. However, only the Germans, even in defeat, committed jet aircraft to combat operations. Between 1935 and 1945, the Germans, British, and Americans all raced to see who could develop jet engines first and best, in order to gain the technological edge in the air war and beyond. In the 1930s, as nations braced for war, the German military build up caught Britain and the United States off-guard, particularly in aviation technology. The unending quest for speed resulted in the need for radical alternatives to piston engines. In Germany, Dr. Hans von Ohain was the first to complete a flight-worthy turbojet engine for aircraft. It was installed in a Heinkel-designed aircraft, and the Germans began the jet age on August 27, 1939. The Germans led the jet race throughout the war and were the first to produce jet aircraft for combat operations. In England, the doggedly determined Frank Whittle also developed a turbojet engine, but without the support enjoyed by his German counterpart. The British came second in the jet race when Whittle's engine powered the Gloster Pioneer on May 15, 1941. The Whittle-Gloster relationship continued and produced the only Allied combat jet aircraft during the war, the Meteor, which was relegated to Home Defense in Britain.In America, General Electric copied the Whittle designs, and Bell Aircraft contracted to build the first American jet plane. On October 1, 1942, a lackluster performance from the Bell Airacomet, ushered in the American jet age. The Yanks forged ahead, and had numerous engine and airframe programs in development by the end of the war. But, the Germans did it right and did it first, while the Allies lagged throughout the war, only rising to technological prominence on the ashes of the German defeat. Pavelec's analysis of the jet race uncovers all the excitement in the high-stakes race to develop effective jet engines for warfare and transport. Kay. 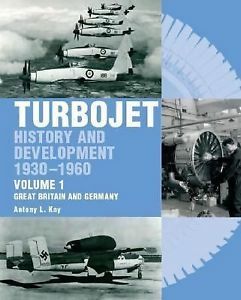 This heavily illustrated book examines the early history and development of turbojet, turboprop and turboshaft engines from the earliest days up to the end of the 1950s, showing you the pioneering work of German and British designers and manufacturers, including the very first jet engines designed by Frank Whittle before World War II. 240 pages, 580+ B&W photographs, engine data tables, and more. 8"x 11", hardcover. This important project brings together the early histories of the development of the turbojet, turboprop and turboshaft engines for the first time. The work of twelve nations [Great Britain, Germany, the Soviet Union, the United States, Japan, France, Canada, Sweden, Switzerland, Italy, Czechoslovakia and Hungary] is described from the earliest days up to the end of the 1950s. This was the Golden Age of aeronautical development and in that time hundreds of engines were developed using the new and exciting gas turbine technology. These engines powered some of the most important and best loved aircraft of the century. USSR, USA, Japan, France, Canada, Sweden, Switzerland, Italy and Hungary. Kay. 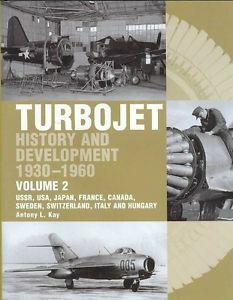 The second and final volume in a complete history on the early years of the jet engine, this book covers all the countries that embarked on jet engine development after the leads established by Great Britain and Germany before World War II. Superbly illustrated with hundreds of photographs of engines - turbojet, turboprop, turboshaft and turbofan - and the aircraft they powered. (See also Volume 1, item #15555). 240 pages, 300 B&W photographs and illustrations, 8"x 11", hardcover. The Fieseler Fi 103, better known as the V-1 "buzz bomb" or "doodlebug," was an early pulse-jet-powered predecessor of the cruise missile that Germany employed against England and Belgium from mid-1944 into the spring of 1945. This 1/48 scale, plastic kit of that early terror weapon (most of its victims were civilians) is a wonderful representation of the original. You get engraved panel and hatch lines, a realistic pulse-jet pod with inlet details, the familiar "vane anemometer" on the nose (used to provide distance information during flight), and more. You even get the transport dolly for display! 6" long; 18 parts, assembly required. V-1 Original WWII German Manuals for the V-1 "Buzz Bomb." 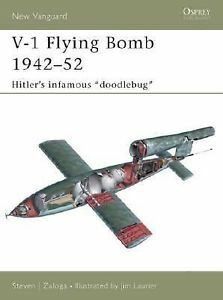 This book contains reprints of original German documents related to the V-1 "buzz bomb," which struck terror into British and Dutch civilians during World War II, as well as information about the U.S. Navy's post-war testing of the V-1 and radio-guided "Loon" missiles. Text primarily in German. 236 pages, B&W illustrations, 8"x 11", softcover. Zaloga. Known to the Allies as the "Buzz Bomb" or "Doodlebug", the V-1 was the world's first cruise missile. This book explores the V-1 in detail, covering its initial concept, first use in 1944, the various Allied counter-measures, and the later use of the V-1 during the Battle of the Bulge. The major foreign derivatives, including the U.S. copy "JB-2 Loon" and numerous post-war Soviet variants, are also covered. 48 pages, 35 B&W photographs, 7 pages of color illustrations, 7"x 9", softcover. The first deployment of the V-1 was in June 1944 when, following two years of tests, Hitler gave the order to attack England. Known to the Allies as the "Buzz Bomb" or "Doodlebug," the V-1 was the world's first cruise missile. 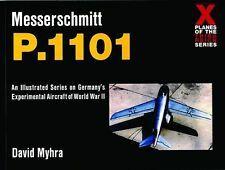 This book explores the V-1 in detail, from its initial concept, first use in 1944, the various Allied counter-measures, and the later use of the V-1 during the Battle of the Bulge. The major foreign derivatives, including the US copy "JB-2 Loon" and numerous post-war Soviet variants, are also covered. Now, you can recreate one of the most daring missions of World War II! a Nazi V-1 flying bomb and a Gloster Meteor III - the Royal Air Force's first operational jet fighter - trying to shoot it down, this 1/72 scale, plastic set includes everything you need to build both kits. 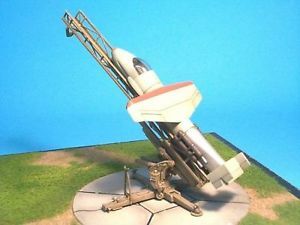 You even get eight acrylic paints with brushes, poly cement, and a stand to display the V-1 and Meteor together in flight! Griehl. This photo-essay, one of a 21-volume series, covers every aspect of the Luftwaffe in World War II, examining the men and the aircraft they flew as it charts the rise and fall of this mighty force. This softbound, 72 pg. volume contains 106 B&W photos along with 8 pages of color and measures 7"x 10". As the Allies intensified their bombing of the Third Reich, the Luftwaffe's conventional fighters seemed taxed to their very limit, making the sudden appearance of rocket aircraft, when Major Spate attacked a P-47 over northern Germany in May 1944, the advent of Germany's last hope. 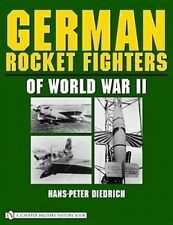 This volume presents extremely rare photos of Germany's rocket planes and vividly captures the wartime career of the Third Reich's secret weapons. Using images taken during the war of aircraft under development and in the field, this comprehensive study examines the rocket planes' appearance and markings and the pilots who flew and tested the aircraft. 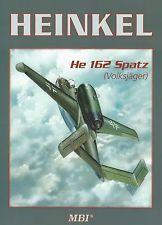 The book covers the Me 163B ('Komet'), Me 163BV1, Me 163AV4, and also examines a number of key experimental planes the Me 262 C and the 'Natter', for example. 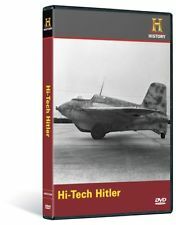 This DVD on the Me 163 - the world's first rocket-powered fighter, which took to the skies over German in the final days of World War II - includes an original short film covering the history of the craft; development, engine testing and flight testing footage; a vintage USAAF briefing on the Me 163; World War II gun camera film of the Me 163B in combat; still photos of the Me 163; a special "Modeler's Notes" audio commentary track; and more. B&W, 1 hr. 38 min. This program explores remarkable engineering and scientific accomplishments - from jet power to the electron microscope - pioneered by the Third Reich, including many that have helped to radically transform the world for the better. You'll examine the role of science and technology in Hitler's Germany, learn why so many important advances emerged from the reviled regime, track the ongoing influence of Nazi science today, and more. Color and B&W, 50 minutes. Find out how some of the most spectacular technological advances of the 20th Century emerged from one of the darkest chapters in world history as MODERN MARVELS reveals the many advances in science and technology that emerged from Germany during Hitler's horrible reign of power. In addition to being the first to prove that smoking caused cancer, Nazi scientists also perfected the hi-fi recording equipment that allowed the F�hrer to contaminate the entire country of Germany with his infectious, diabolical philosophy, and helped to perfect the very first jet-powered warplanes. And while the Third Reich would ultimately crumble, much of the technology they conceived is still being used in the 21st Century. HI-TECH HITLER explores the manifold engineering and scientific accomplishments of the Nazis many of which helped to radically transform the way we live today. When Hitler came to power Germany was one of the world's most technologically advanced nations. In the midst of carrying out the atrocities of the Holocaust the soldiers who made up Hitler's murderous regime were also charged with furthering Germany's foothold in the fields of science and technology. Under the leadership of the F++hrer Nazi scientists were the first to establish a direct link between smoking and cancer. In an attempt to boost Nazi propaganda broadcasts Hitler exploited the discovery of hi-fi recording equipment. Finally it was during Hitler's time that the very first jet-powered fighter plane flew fully equipped with the first pilot ejection seat. Now in this intriguing program find out how and why so many positive advancements emerged from so much horror and track the ongoing influence of both the feats and failures of the Third Reich. From jet power to the electron microscope HISTORY presents a distinctive look at the role of science and technology in Hitler's Germany. WWII Flying Wing Bomb, America's First Cruise Missile, The Northrop "Bat Bomb" and the GE B-1 Engine. Carpenter & D'Alessandro. Examine America's answer to the German V-1 Buzz Bomb through original documents, photos and interviews with participants. With an airframe designed as a manned aircraft and a turbojet engine, this late-war weapon, which never saw action, was the precursor to cruise missile technology. 52 pgs., 80 B&W photos, drawings, 8"x 11", sfbd. Messerschmitt Production and Flight-Testing at Regensburg 1936-1945. Schmoll. 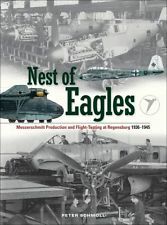 Filled with firsthand accounts from test pilots and Luftwaffe personnel as well as many rare photographs, this book examines the workings of the famous Messerschmitt works at Regensburg, which produced many of Nazi Germany's key aircraft, including the Bf 109, Me 210 and Me 410 fighters; the Me 163 rocket interceptor; the Me 262 jet fighter; and the massive Me 321 and Me 323 "Gigant" series of transports. 192 pages, 215 B&W photographs and illustrations, 9"x 12", hardcover. Myhra. With its single turbojet engine and signature "Multhopp T-tail," the Ta 183 had been selected for immediate series production in March, 1945, and it was believed that the 183's maiden flight might occur as quickly as June, 1945. Post-war, the Ta 183 became the "mother" of the Soviet MiG-15. This photographic history features 129 mostly previously unpublished photos, 3-view line drawings, and stunning state-of-the-art digital color images. 64 pgs., 11"x 8", sfbd. The RLM called upon Heinrich Hertel of Junkers Flugzeugbau to give the aging 163 a complete make over and make up for all the initial items it lacked - that is a cruising HWK 509 bi-fuel liquid rocket engine with a duel combustion chamber, tricycle landing gear, C and T-Stoff fuel tanks in the wings to provide longer flight duration, and so on. Myhra. Powered by a single turbojet engine, the 1101 was an attempt to produce the world's first variable wing sweep, ultra light weight interceptor, armed with Germany's state-of-the-art wing-mounted air-to-air guided missiles. An incredible attempt for its day, with the work later being continued by Bell, resulting in the U.S. X-5. This volume features mostly previously unpublished photos and 3-view line drawings. 64 pgs. with over 100 photos and line drawings. 11"x 8", sfbd. On July 25, 1944, the future of air combat was changed forever when the revolutionary German jet fighter, the Messerschmitt Me 262, attacked an RAF Mosquito flying over Munich. In this fascinating video, you'll see details not only of that cutting edge Me 262, but also of an entire generation of highly advanced combat types employing jet and rocket propulsion. You'll even see the first of Hitler's "revenge" weapons - the V-1 flying bomb and V-2 rocket - that were intended to turn the tide of the war. 55 minutes. Though the Germans were unable to complete their P.1077 advanced jet fighters before the Soviets overran the factory, your workbench runs no such risk! This laser-cut balsa wood kit includes a full-size, CAD-drawn plan; a vacuum-formed canopy; skids and gun pods; colored tissue and decals; FAI rubber and a propeller; and more. For display, rubber-, or Jetex-powered flight; 13" wingspan, assembly required. 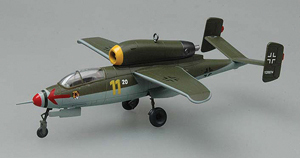 the Heinkel He 162A-2 jet fighter (which went from drawing board to first flight in just 69 days) flown by 16-victory ace Oberleutnant Karl-Emil Demuth - Staffelkapitn of 3./JG 1 - in defense of the Reich in May, 1945, this hand painted, 1/72 scale, plastic model features textured surfaces, a detailed cockpit with an ejection seat and a glazed canopy, extended tricycle landing gear, and authentic markings, including nose colors that indicate the pilot wore the German Cross in Gold and 16 victory bars on the vertical fins. Measures 5" long and includes a display stand. The 19th release in the Oxford Diecast series of 1/72 scale, die cast warplanes, this model replicates an He 162A-2 Volksjaeger ("People's Fighter") single-engine, jet-powered fighter flown with II./JG 1 when it evacuated from Marienehe to Leck, Germany, in May, 1945. You get engraved panel lines; a detailed cockpit with a glazed canopy; prototypical anhedral wingtips; a pitot tube, an antenna, and other fine detail parts; an authentic paint scheme; and more. 5" long; includes a display stand identifying the plane and unit. Treadwell. During World War II, German scientists and engineers were under constant pressure by German High Command to develop planes and weaponry that were at the very cutting edge of aviation technology. In this volume, you'll learn of the technological advancements those scientists and engineers achieved and see how, as the war drew to a close, they were caught between the Allies who wanted to control them and the SS who would stop at nothing to prevent them from falling into enemy hands. 192 pages, 6"x 10", hardcover. The design, development, and application of the Nazi aircraft--a story of technological genius harnessed by the pressures of war Throughout much of World War II the Nazis' military technology was far more advanced than anything the Allies could produce. Here, an aviation historian tells the story of the planes and weaponry that represented the cutting edge of aviation technology, detailing their design, development, and application, and the struggles of those who built them. German scientists and engineers were always under pressure from the German High Command during the conflict, and as it drew to a close they were caught between the Allies who wished to control them, and the SS who would stop at nothing to prevent them falling into Allied hands. This book provides unrivalled insight into the aircraft that made Germany an almost indomitable enemy. The design, development, and application of the Nazi aircraft-a story of technological genius harnessed by the pressures of war Throughout much of World War II the Nazis' military technology was far more advanced than anything the Allies could produce. Here, an aviation historian tells the story of the planes and weaponry that represented the cutting edge of aviation technology, detailing their design, development, and application, and the struggles of those who built them. German scientists and engineers were always under pressure from the German High Command during the conflict, and as it drew to a close they were caught between the Allies who wished to control them, and the SS who would stop at nothing to prevent them falling into Allied hands. This book provides unrivalled insight into the aircraft that made Germany an almost indomitable enemy. German Experimental Aircraft of World War II. Griehl. From jets and high altitude aircraft to radar-equipped fighters configured to deliver chemical weapons, numerous Luftwaffe aircraft designs reached prototype stage but never made it into mass production and battle. This book is a definitive, revelatory guide to the remarkable range of secret planes that the Third Reich envisioned but failed to complete. 80 pages, 114 B&W photographs, 6"x 9", hardcover. A Fascinating collection of photos of experimental and prototype planes of the Luftwaffe, this title reveals plans for jet planes and high altitude aircraft, and radar-equipped fighters configured to deliver chemical weapons. 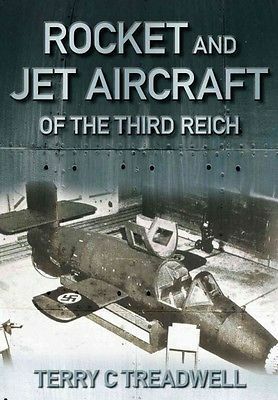 It is a revelatory insight into the aviation science of the Third Reich. From jet planes and high altitude aircraft to radar-equipped fighters configured to deliver chemical weapons, numerous Luftwaffe planes were designed and reached prototype stage but never made it into mass production or battle. 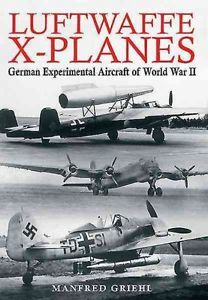 Luftwaffe X Planes is a definitive, revelatory guide to the remarkable range of secret planes that the Third Reich failed to complete.Despite the Allied authorities ban on research, countless aircraft were designed and tested by the Luftwaffe and German manufacturers before World War II. 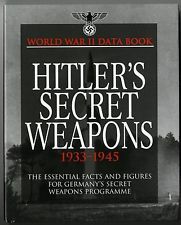 The research went ahead at secret evaluation sites in Germany, Switzerland, Sweden and the USSR. After the outbreak of the war this work continued. Many projects remained on the drawing board or at prototype stage because either they were deemed unsuitable or, as is the case with most of those in this selection, the developers simply ran out of time and the projects never went into production.Renowned aviation expert Manfred Griehl has painstakingly assembled a valuable selection of images which shows the remarkable range of projects dreamed up by the German designers. Had these innovative projects ever been realized the course of the World War II could have been dramatically different." Muller. Featuring more than 200 German documents photographed in their original state, this heavily illustrated volume examines the development, manufacture and operation of the single-engine, jet-powered, Heinkel He 162 Volksjger (People's Fighter), which was fielded by the Luftwaffe in the final days of World War II. You'll learn about its propulsion, camouflage, armament, cockpit, and more. 430 pages; 140 B&W photographs, 30 color plates and 50 scale drawings; 8"x 11"; hardcover. An in-depth look at this controversial late war jet fighter from Heinkel. The profile consists of 72 pages and covers the political background behind the development of the aircraft, construction of the prototypes and operational variants. The book also looks at the projected variants, including the two-seat training glider and combat utilization of the type. Post war testing by the victorious allies is also covered, as is a round up of the examples to be found, today, in the aviation museums of Europe. Also within the pages are 1/72 and 1/48 scale drawings, numerous black and white photos and detail drawings and diagrams. Colour artwork consists of 5 pages, plus the outside back cover, covering prototype, operational and test examples of the He 162 and 10 pages of close up colour photography of preserved aircraft and components may also be found. The book concludes with a technical description of the type. Barry Spicer. An Arado Ar 234 flown by Oblt. Erich Sommer - accompanied by an Me 262 - continues its climb to 34,000 feet during the world's first jet reconnaissance mission, which flew on August 2, 1944, to photograph the lodgement area held by the Allies in Normandy. 31"x 23" limited edition, numbered print is signed by the artist and by Sommer. 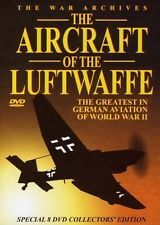 Through vintage footage, this 8-disc collection covers every aspect of Luftwaffe aircraft and their efficient, deadly threat to the Allied forces of World War II, from the menacing gull-winged Stuka dive bomber and the workhorse Ju 52 transport to revolutionary jet-propelled fighters such as the Messerschmitt Me 262. B&W and color, 7 hrs. 15 min. From the menacing gull-winged Stuka diver bomber, through the revolutionary jet-propelled fighters such as the Messerschmitt Me-262, to the transport workhorse of the German air-force, the Ju-52, every aspect of the Luftwaffe is documented in great detail. Using real-life documentary footage from the time, discover why the German air-force was an efficient and very deadly threat to the Allied forces of World War II. Radinger & Schick. 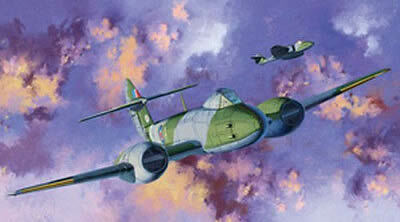 Portrays the P1101 swept-wing jet fighter that succeeded the Me 262. Information on this unique craft was not available until now. Complete facts and figures, development data and photos, plus comparisons with other Luftwaffe fighters. 200 photos, 208 pgs., 8"x 11", hdbd. 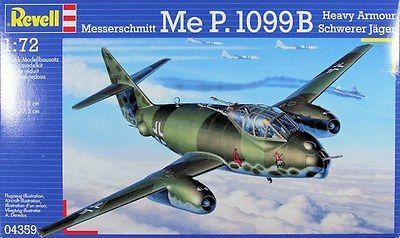 The P1101 was Messerschmitt's second jet aircraft after the Me 262. Designed as a fighter, the test version of this type was to serve as an experimental aircraft to test the swept wing concept. After World War II, the P1101 was brought to the U.S.A. and served there, among other things, as a testbed for the similar developments. Photos and data of this astonishing, yet understandably unkwn aircraft with its futuristic techlogy are rare. This new book is a comprehensive documention. where t only the development history with all the important data concerning the P1101 is gathered, but also photos, detailed facts and figures about this aircraft. Of particular te are the numerous tabular comparisons with similar German and foreign aircraft from the war and post-war era. While there are innumerable German technical publications about well-kwn, mass-produced Messerschmitt aircraft, the authors have been successful with this book in supplementing these works with the portrayal of the last almost completed Messerschmitt aircraft. Willy Radinger and Walter Schick are also the authors of Messerschmitt Me 262: Development/Testing/Production (available from Schiffer Publishing Ltd.). Ransom, Korrell & Evans. The extraordinary Junkers Ju 287 - the first truly swept-winged, jet-powered aircraft - took to the sky in August, 1944, when Germany was suffering round-the-clock bombing by the Allied forces. 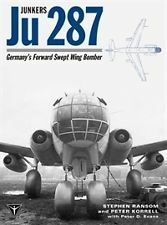 This lavishly illustrated book examines the Ju 287 in detail, tracing the development of the forward swept-winged aircraft prior to the 287's appearance, the aircraft's subsequent history in the Soviet Union, its post-war influence on aircraft projects, and more. 160 pages, 130 B&W and color photographs, 9"x 12", hardcover. The World's First Swept-Wing Jet Aircraft. Lommel. In the summer of 1944, the prototype of the Ju 287 V1, a four-engine jet bomber with forward swept wings, took to the skies over Leipzig-Brandis and made history with its unusual design. This book reveals the striking craft through previously unpublished reports, photographs and drawings, examining not only its specifics but also its contributions to future jet aircraft designs in both the East and the West. The extraordinary Junkers Ju 287, the first truly swept-winged, jet-powered aircraft, took to the sky in August 1944, at a time when Germany was suffering sustained round-the-clock bombing by the Allied air forces. Despite such adverse development conditions, this large and futuristic aircraft represented a remarkable accomplishment in aeronautical design. It featured a revolutionary swept forward wing and was built largely from scavenged components from other aircraft. The project was considered ‘top secret’ and evaded Allied intelligence for many months. Arado Ar 234 & Junkers Ju 287 Kobel. First used in combat in World War II, the Ar 234 and the Junkers Ju 287 were major developments in aircraft design. Here is the illustrated history of these groundbreaking aircraft. 48 pgs., 8"x 11", sfbd. Porter. This heavily illustrated book examines the pioneering development and operational history of Nazi secret weapons, including rocket- and jet-propelled aircraft, the pilotless plane, long-range rocket technology and "robot" bombs, the world's first super-heavy tanks, and others. 192 pages, 150 color and B&W photographs and illustrations, 7"x 9", hardcover. 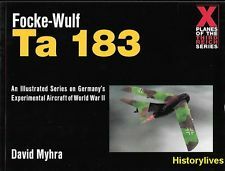 This lavishly illustrated volume describes the Luftwaffe's jet and rocket-powered bomber, ground-attack, night fighter, reconnaissance, training and transport aircraft projects, including the Ju 287, the Arado 234, the Heinkel 343, the Me 264, the Ta 400, the BV P.188, the Me 163 and Me 263, and others. Volume One is also available . 200 pages, B&W and color photographs, color illustrations, 9"x 12", hardcover. Conceived as the Luftwaffe's last desperate effort of WWII, the He 162A was a German experimental concept known as the Volksjäger, or People's Fighter, because it could be inexpensively mass produced. The "Julia" was a rocket-propelled fighter with four solid fuel rockets to assist its vertical takeoff and skids on its undercarriage for landing. The pilot lay prone with spartan instrumentation in the cockpit. One of Germany's most intriguing experimental fighters. While never operational, it was clearly a revolutionary idea. This version of the P.1077 would have been almost entirely different from the Julia because it was to be powered by a pulse jet and the pilot was to be seated in an upright position. One of Germany's most intriguing experimental fighters. While never operational, it was clearly a revolutionary idea. The semi-expendable, not suicide, vertically-launched, piloted rocket plane was designed to meet an Allied bomber formation and launch rockets at it, only to then come around for a ramming attack. Although a modified version of the original design was built and put in service, none of these rocket aircraft saw action. The small interceptor was designed by a team headed by Erich Bachem. The Ba 349 was built using bonded and screwed wooden parts, a simple metal structure and an armored cockpit. The heart and soul of the aircraft was the internal Walter 109-509A-2 liquid fuel rocket that was also used in Me 163 Comet. In October 1944 pilotless tests from near-vertical ramp and piloted gliding flights were started. On 28 February 1945 the first manned flight was attempted, resulting in the death of test pilot Oberleutnant Lothar Siebert when the cockpit canopy flew off, and the Ba 349 crashed. .
Not Available at this time, but the picture was very interesting so I left it on the site.